The Ice Cream Bar serves Touch of Grey, a soda made with candycap mushroom syrup, cream, and acid phosphate. • Last weekend, The Ice Cream Bar opened in San Francisco's Cole Valley to fill that neighborhood's void of artisan sundaes, sorbets, and ice cream sandwiches. But the real star of this show is in the back of the shop, where there's an old-time soda fountain. Staffed by a knowledgeable and friendly Jerk, the fountain's choices dwarfs that of the ice cream counter. It is reviving previously lost creations like crushes, or fresh fruit-based sodas; flavored sodas with acid phosphate, a 19th century agent of tartness that predates citric acid; and flavored sodas with extinct lactart, an acid additive that creates a dry feel. The fountain's menu manages to be reverent to the past and wildly futuristic, with almost as many savory as sweet possibilities. There is also the option to customize from a list of 13 syrups (including chicory coffee, chocolate, and pistachio), 24 house-made extracts (such as dill weed, nutmeg, and rosemary), and the daily selections from more than 75 tinctures, also crafted in-house. 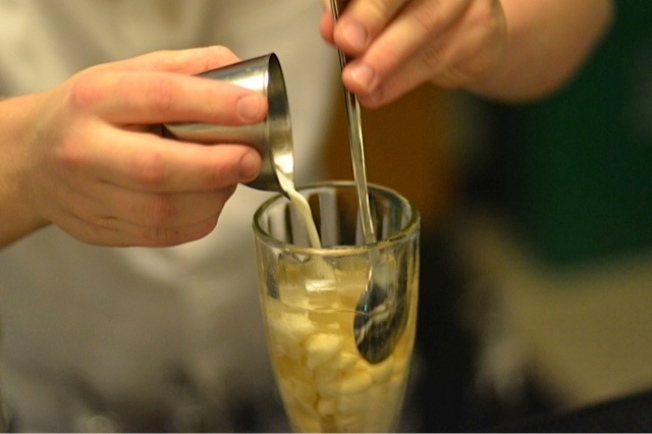 Good Taste was rewarded with rich, satisfying flavor and grand, beautiful bubbles in Touch of Grey, a soda made with cream, acid phosphate, and a syrup made of candy cap mushrooms. The seeming strangeness of what in reality is a fungal beverage disappears in the straw, where a mellow maple flavor is balanced with a slight sour quality from the acid phosphate. Whether that sounds wonderful or terrifying, The Ice Cream Bar is still a place worth considering. Drinkers can be as safe or as crazy as they please. And, if not, there's always ice cream. • A new restaurant aiming for nationwide expansion will open its first location in Palo Alto's Town & Country Village next month. Helmed by executive chef Grace Nguyen, who previously worked in San Francisco at Slanted Door and sister restaurant Out The Door, Asian Box will offer fare inspired by Southeast Asian street food with local ingredients. In an introductory video posted on YouTube, owner Frank Klein tributes the city of Palo Alto and the late Steve Jobs, saying he can't help but want to start this concept in the city that got the world to think different. Asian Box plans two more Bay Area locations this year, but hasn't yet announced where they'll be.